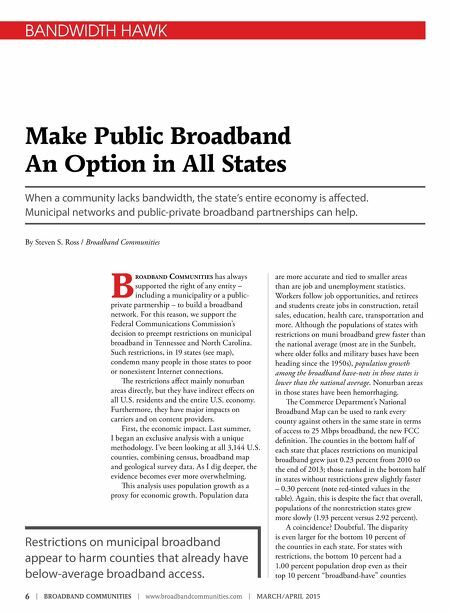 6 | BROADBAND COMMUNITIES | www.broadbandcommunities.com | MARCH/APRIL 2015 BANDWIDTH HAWK B roadband Communities has always supported the right of any entity – including a municipality or a public- private partnership – to build a broadband network. For this reason, we support the Federal Communications Commission's decision to preempt restrictions on municipal broadband in Tennessee and North Carolina. Such restrictions, in 19 states (see map), condemn many people in those states to poor or nonexistent Internet connections. Te restrictions afect mainly nonurban areas directly, but they have indirect efects on all U.S. residents and the entire U.S. economy. Furthermore, they have major impacts on carriers and on content providers. First, the economic impact. Last summer, I began an exclusive analysis with a unique methodology. I've been looking at all 3,144 U.S. counties, combining census, broadband map and geological survey data. As I dig deeper, the evidence becomes ever more overwhelming. Tis analysis uses population growth as a proxy for economic growth. Population data are more accurate and tied to smaller areas than are job and unemployment statistics. Workers follow job opportunities, and retirees and students create jobs in construction, retail sales, education, health care, transportation and more. Although the populations of states with restrictions on muni broadband grew faster than the national average (most are in the Sunbelt, where older folks and military bases have been heading since the 1950s), population growth among the broadband have-nots in those states is lower than the national average. Nonurban areas in those states have been hemorrhaging. Te Commerce Department's National Broadband Map can be used to rank every county against others in the same state in terms of access to 25 Mbps broadband, the new FCC defnition. Te counties in the bottom half of each state that places restrictions on municipal broadband grew just 0.23 percent from 2010 to the end of 2013; those ranked in the bottom half in states without restrictions grew slightly faster – 0.30 percent (note red-tinted values in the table). Again, this is despite the fact that overall, populations of the nonrestriction states grew more slowly (1.93 percent versus 2.92 percent). A coincidence? Doubtful. Te disparity is even larger for the bottom 10 percent of the counties in each state. For states with restrictions, the bottom 10 percent had a 1.00 percent population drop even as their top 10 percent "broadband-have" counties Make Public Broadband An Option in All States When a community lacks bandwidth, the state's entire economy is afected. Municipal networks and public-private broadband partnerships can help. 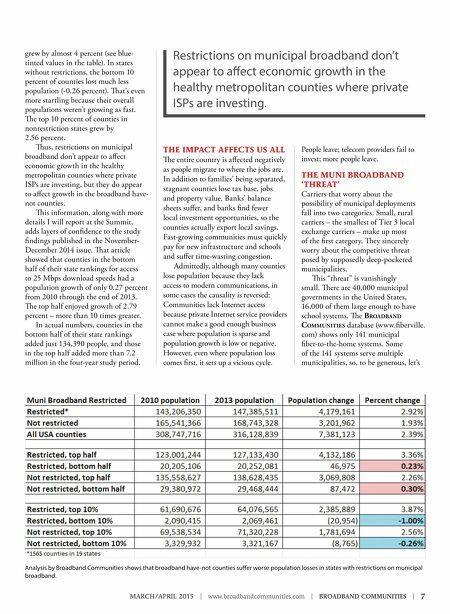 By Steven S. Ross / Broadband Communities Restrictions on municipal broadband appear to harm counties that already have below-average broadband access.